Sleep in or get an early start to the day—choose what works best for you and your family. 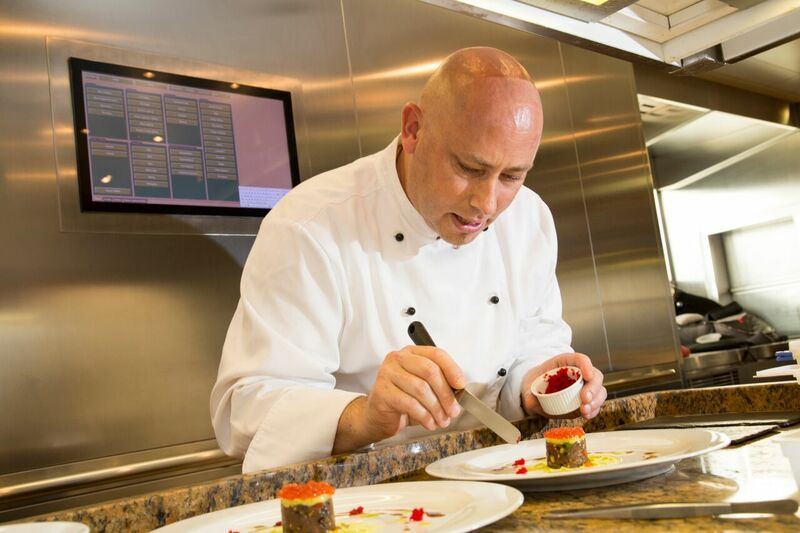 With a chef and a flexible schedule, your luxury yacht charter is your very own floating 5-star restaurant. 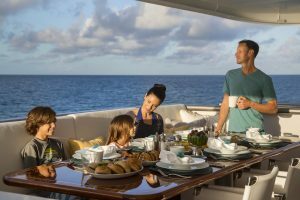 During breakfast, the captain will discuss activities—a water activity, hiking, a beach day, reading books, or going ashore. Perhaps there are lovely reefs nearby that are perfect for snorkeling—rest assured that your captain will inform you of all the best spots. 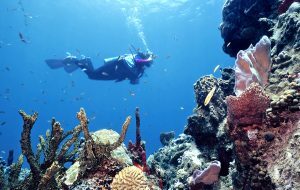 The crew will be happy to supply you with everything you need for your underwater excursions, such as fins, snorkels, and masks, and other water toys on board. Or perhaps visit a historic site ashore with your own museum quality private guide, or shop in chic boutiques. fantastic opportunity to take in more of the breathtaking scenery and dip your toes into the local culture. You can have your own catered onboard lunch, or choose to enjoy some local cuisine at a quaint cafe or trattoria just off the coastline. Or, have a picnic created by the crew on a lovely beach. After lunch, take part in more water sports, go on a coastal hike, play games on board, or simply relax on the sun-soaked deck. Just before dinner, the entire family can meet up for another perfectly catered meal. Then, perhaps you hear a local band playing on shore, so you get the ship’s tender and go ashore. No matter where the night takes you, end it by enjoying your favorite movie on a huge screen or perhaps stargazing from the top deck. pumping. When you’re not sunbathing on the top deck or doing some yoga during sunrise, dance the day away to your favorite music with the wind in your hair, or perhaps have a cooking lesson with your private chef. Want to celebrate an important occasion or have a fun special theme night on board? 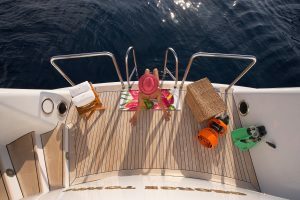 Your luxury yacht charter staff is always ready to help you have the best possible experience and create a fun-filled atmosphere A yacht charter is the perfect place to enjoy private fun on board with music, dancing, or whatever your heart desires. Love food? 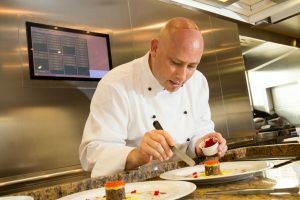 You don’t need a party as an excuse to get a culinary lesson from the professional chef—for yourself, you and your spouse, or even the entire family. Want to maintain your exercise regime while on vacation? Get your workout in the yacht’s gym or gym equipment, depending on the yacht chosen, or enjoy a vigorous hike ashore in lovely surroundings. One of the best things about a yacht charter is that you can visit multiple coastline destinations. Island hopping and spending time in coastal mainland towns and villages give you the opportunity to experience beautiful sights, foods, and pristine beaches. 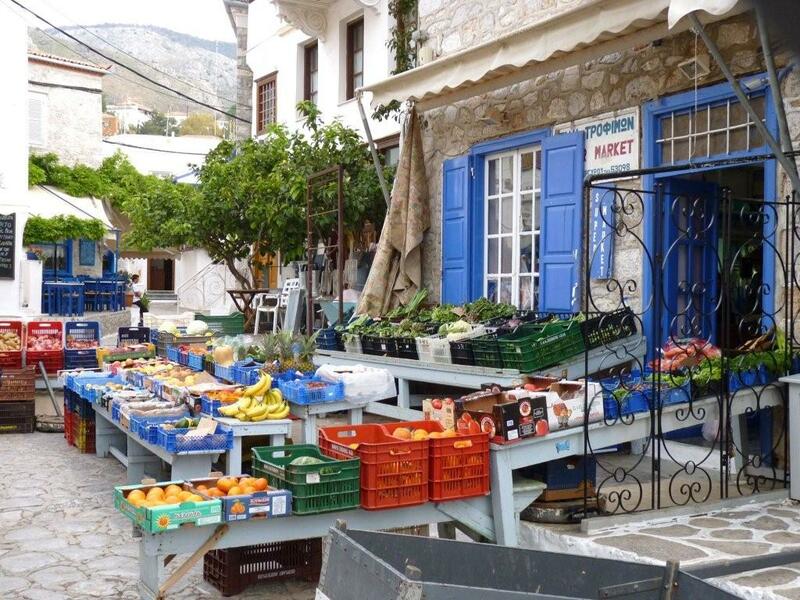 You can spend hours shopping for authentic souvenirs, sampling local delicacies, exploring local history, and experiencing a new, unique culture. There’s so many things to see and do. Every stop on your yacht vacation offers a chance to visit a shop or venue, or simply sprawl out on a secluded beach to work on your tan. Enjoy bustling nightlife as you dance the night away to local music at a club, explore parks and hiking trails, or those in the know can hunt for some geocaches on land to add to their finds. There are a plethora of exciting activities to do in the water—there’s something for everyone. You can get to know the magical world beneath the sea by snorkeling, or just float around your yacht on an inner tube. 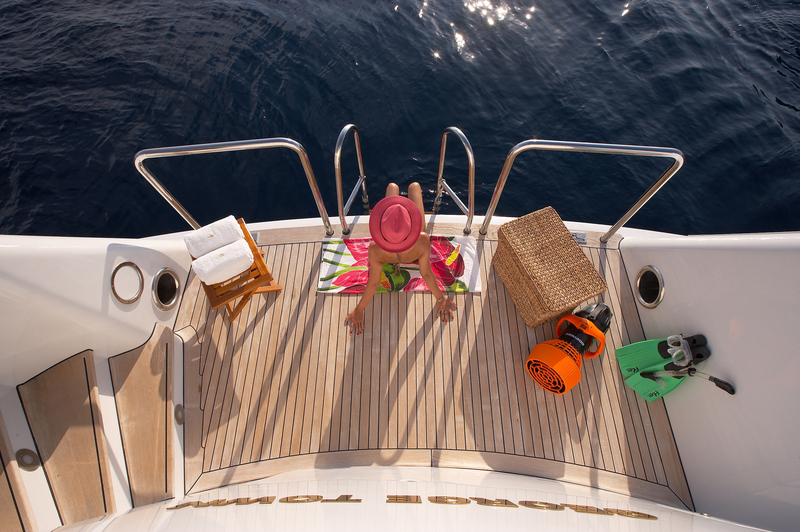 Whatever water activity you and your family choose, your private yacht may have all the equipment and water toys you’ll need, or might be able to rent certain toys to have on board for your charter. 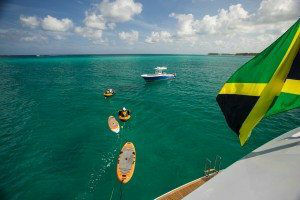 Some yachts have paddle boards, jet skis, sea bobs, tow toys, water skis, floating islands, and kayaks. Put on some scuba gear and admire the coral underneath the bright blue sea, or grab some noodles and have some fun with the kids. Inflatable toys and more can be pulled by the yacht’s tender. Whether you are vacationing with a family or as a couple, there’s no shortage of water fun you can have. There are endless possibilities to consider when booking your luxury yacht charter vacation. No matter how you choose to spend your days, you can bet that a private yacht vacation offers a unique, customized, and unforgettable experience for you and your entire family. Let Northrop-Johnson Yacht Charters assist you in the planning. Contact us today about renting your own private crewed charter yacht, and find out how you can book your voyage to the exotic, outstanding destination of your dreams.